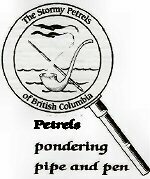 The next regular meeting of the Stormy Petrels of BC will take place on November 1st at 7:00 pm at Hampton Place. Please contact your Consulting Detective for exact address details. Thank you to Gloria Scott for hosting our previous two meetings. Have you ordered your copy of “The Narrative of John Smith”? This novel is Arthur Conan Doyle’s lost first novel and has just been published for the first time.